Square-Enix will open a new studio with over a hundred employees in 2012. The Japanese videogame publishing conglomerate is negotiating with the Canadian governments to open a new development studio in one of the three possible locations: Vancouver, Toronto and Montreal. Square already owns Eidos Montreal, which it received in the 2009 merger. 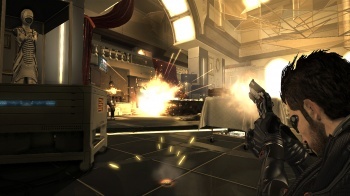 Eidos Montreal, maker of the forthcoming Deus Ex: Human Revolution, is the fourth largest game studio in the city behind EA, Ubisoft and Behaviour. The new studio would hopefully benefit not only from the tax credits all game studios enjoy in Canada but also a flat subsidy from the Quebec government. Such deals have been struck with THQ and Warner Bros. (for 3.1 million and 7.5 million dollars respectively) and the director of Eidos Montreal, StÃ©phane D'Astous, believes that Square-Enix's new studio should get a similar agreement. "When Eidos arrived in Montreal in 2007, the government made a fair offer, but much water has flowed under the bridge for four years," D'Astrous said, as translated from the original French interview by Google. "The negotiating process has begun," said D'Astous. "However, each city has its advantages. Vancouver has an interesting pool of available talent with all the studio closures. Toronto is excessively business-oriented. Montreal has an established reputation and great creative potential." Interestingly, the new studio will be designed work on games for the next generation of game consoles. "The new consoles from Microsoft, Sony and Nintendo will require more attention and more staff," said StÃ©phane D'Astous. "We want to prepare ourselves." All three major console manufacturers have stated that no new generation was coming anytime soon but perhaps D'Astrous knows something we do not. In the 60s, Canada was a destination for many American draft dodgers who chose not to participate in the Vietnam War. Then in the 90s, TV and movie production shifted north of the border as Canadian provinces offered a cheaper alternative to filming in the States. We may now be witnessing another great migration as more videogame publishers are choosing to settle in Quebec, Montreal and Vancouver because of the attractive tax breaks these cities offer. Similar programs exist in other countries and/or individual states in America, and while Square is also reportedly looking at locating the studio in Raleigh, NC, Atlanta, GA, or Orlando, FL, the draw of Canadian taxpayers' money continues to fuel the migration. Will the majority of videogames come from Canada in the next generation of videogame consoles?